It’s back to school time and last week as I dropped my daughter Caroline off at her first day of first grade, I remembered the excitement that a new school year brings. I wanted to give a message to our students: Seize the opportunities that come with each academic year. Whether you’re starting kindergarten or finishing college, it’s an opportunity: an opportunity to work hard, attain new skills and discover talents. While some of you may not enjoy those multiplication tables, others might find the reading assignments to be drudgery, still others may have difficult jobs and obligations after class, or live in a home where it’s always a challenge to make ends meet, or be stuck in a lagging school system. These challenges are real, and they are often factors in students’ success rate. But let me tell you one thing: Don’t let anyone else determine your future for you. When critics don’t think you can get great grades, or make the all-star team or be admitted to the most rigorous school, that should encourage you even more to do your best. This is the best of the Texas tradition. We have so many great innovators before us who refused to accept failure. In the 1960s, for example, Mary Kay Ash found the male-dominated business world nearly suffocating, but rather than giving up, she created a new business model that would enable women to be both successful businesswomen and mothers and that put customers first. It has now become one of the best-selling cosmetic companies in the country. In the 1970s, Willie Nelson moved back to Texas. After being inspired by the emerging rock and jazz scene in Austin, he broke the mold of Tennessee country and created an untried genre now known as outlaw country. His record sales soon skyrocketed, he emerged as one of our great icons and today, we consider albums like “Texas in My Soul” to be Lone Star staples. In the 1980s, when everyone said the oil boom was finished, pioneers like George Mitchell refused to accept that the Texas soil was done giving, and he spent years innovating ways to crack the Barnett Shale, which eventually resulted in hydraulic fracturing, a practice that continues to revolutionize our nation’s energy supply and lead to more energy independence. It was through their determined and innovative spirit that a floodgate of job opportunities opened to countless Texans and Americans. There’s nothing stopping you from doing the same. You are fortunate to have parents and grandparents who have made sacrifices so that you may succeed, and teachers who work long hours to make sure you learn as much as possible. Thank them for all they do to help you succeed and honor them by making the most of every single opportunity. Best of luck, and God bless Texas. 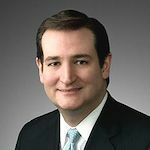 Ted Cruz, a Republican, was elected to the U.S. Senate in 2012.